Before we delve into the four types of annuities, let’s start with a simple question: What is an Annuity? An Annuity is simply an insurance product that guarantees income – usually during your retirement years, but can also be used to meet other long-range goals. An annuity may be purchased with either a single payment or a series of payments or contributions. Then the insurance company is obligated to make regular payment to you either immediately or at a scheduled date in the future. There are four different types of annuities. At Annuity Watch USA, we specialize in fixed index annuities, and when you understand the basics of each type, you will see how fixed index annuities stand out above the rest. 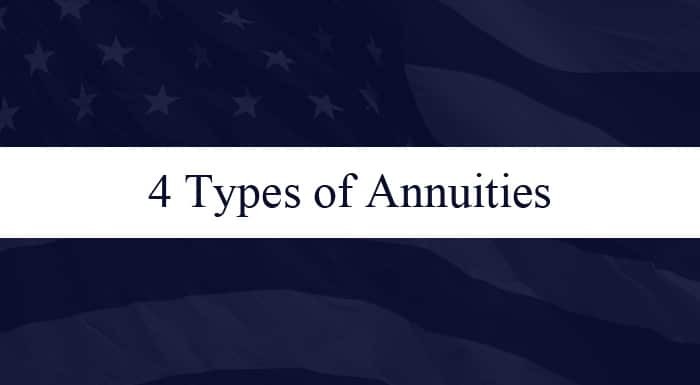 So, let’s start by taking a look at each of the four types of annuities. The first type of annuity is called an Immediate Annuity. Just like you’d expect from the name, an Immediate Annuity begins paying income checks immediately after being funded by a lump sum premium deposit. Income checks usually start within 30 days and will continue for the rest of your life. The bad news is there is sometimes no death benefit with an Immediate Annuity…which means when you die, the insurance company stops making payments and any principal you haven’t taken as income, stays with the insurance company. For more see, The Guide to Understanding Immediate Annuities. The second type of annuity is called a Fixed Annuity. A Fixed Annuity is a contractual guarantee from an insurance company that they are going to pay you a fixed rate of interest for a fixed period of time. For instance: 1% for 4 years……..2% for 7 years……….or 4% for 10 years. Some people think of Fixed Annuities as being similar to a CD. The main difference is, a CD is guaranteed by a bank, and a fixed annuity is guaranteed by an insurance company. However, unlike a CD, money in a Fixed Annuity grows tax deferred… you do not pay any taxes on the interest earned until you withdraw it. When buying a fixed annuity be sure to read the fine print. Some companies offer multi-year contracts with an attractive interest rate, but if you read carefully, the rate is only guaranteed for the first year. For more see, The Guide to Understanding Fixed Annuities. The third type of annuity is a Variable Annuity. Variable annuities have been around for over 50 years, but they became very popular when baby boomers started investing for retirement. Baby boomers liked the tax-deferred growth offered by IRA’s and other qualified plans, but there are limits as to how much investors can contribute each year. Variable annuities offered a solution to the problem of low contribution limits because they allow you to invest in mutual funds inside a tax-deferred insurance vehicle with no investment limits. Keep in mind, the underlying investments in variable annuities are mutual funds, so your principal is not guaranteed and will go down in value if the underlying investments go down in value. While the insurance company may guarantee a death benefit or an income value, it DOES NOT offer principal protection in a variable annuity. For more see, The Guide to Understanding Variable Annuities. The fourth kind of annuity is the one that we specialize in at Annuity Watch USA…….the Fixed Index Annuity. In the Fixed Index Annuity, the insurance companies have combined the best features of the other types of annuities, while eliminating some of their drawbacks. As such, the Fixed Index Annuity has exploded in popularity – especially over the last decade. Guaranteed income you can’t outlive from the Immediate Annuity. Principal protection and guaranteed minimum growth from the Fixed Annuity. And the ability to participate in the growth of the stock market from the Variable Annuity. So what drawbacks were eliminated? In an immediate annuity, there was sometimes no death benefit. The interest rates in Fixed Annuities were too low to be attractive – this is especially true in the low interest rate environment we are in currently. And, variable annuities can lose money, and are also full of fees, loads and commissions. So, Fixed Index Annuities offer guaranteed lifetime income, and can still provide a death benefit to your beneficiaries. They combine principal protection with the ability to participate in the positive growth of the market. And, they have a low fee structure. For more see, The Guide to Understanding Fixed Index Annuities. We would like to invite you to watch, free of charge, our newly updated video series on annuities called “Securing Your Retirement Future.” This series is designed to help educate you on the types of annuities and especially on fixed index annuities and how they could be a part of your retirement plan. Simply click the banner below to gain instant access to our free annuity educational video series and if you have any questions or would like to schedule an appointment, please feel free to contact us.